Sweet Tea House artists in 1985. Gonkar Gyatso is fourth from left. 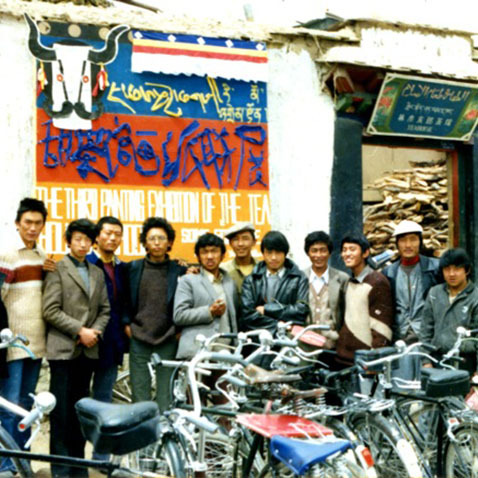 Emerging from the aftershocks, debris and trauma of the Cultural Revolution a loose-knit group of young Lhasa artists in the early and mid-eighties decided to come together to better utilize their individual creativity and to promote their own works. They joking called themselves the Sweet Tea House Movement. In 1985, on the occasion of the UN proclaimed International Youth Year (IYY), a nationwide exhibition and competition of art-works was held in Beijing. Five young Lhasa artists prepared a number of their best paintings for the exhibition, but only one painting was selected. Chinese painters in Tibet were allowed to exhibit many more paintings. Disappointed, the young Tibetan artists decided they had to do something themselves to exhibit and promote their work. So they founded the “ja ngarmo remoi tsokpa”, the “Sweet Tea House Group of Modern Tibetan Painters” that from 1985 held exhibitions of their works in the small Lhasa tea shops where Tibetan youths gathered to meet and talk. These artists felt that by exhibiting their work in a tea-house frequented largely by young Tibetans, they would be contributing to the cultural awareness of the youth of Lhasa. Our young artists were also aware that Monet, Courbet and other French impressionists had gathered at Parisian cafes to discuss their work. I heard all this from Gongkar Gyatso, a member of the Sweet Tea House Group, and I am glad to say I was able to contribute a little supporting anecdote to the chronicle of this legendary group by letting Gyatso know that in 1888, when the paintings of Paul Gauguin were excluded from the official art section of the Universal Exposition in Paris, Gauguin just went ahead and organized his own exhibition at a nearby cafe. Gyatso seemed pleased that this cafe exhibition had been a big success. 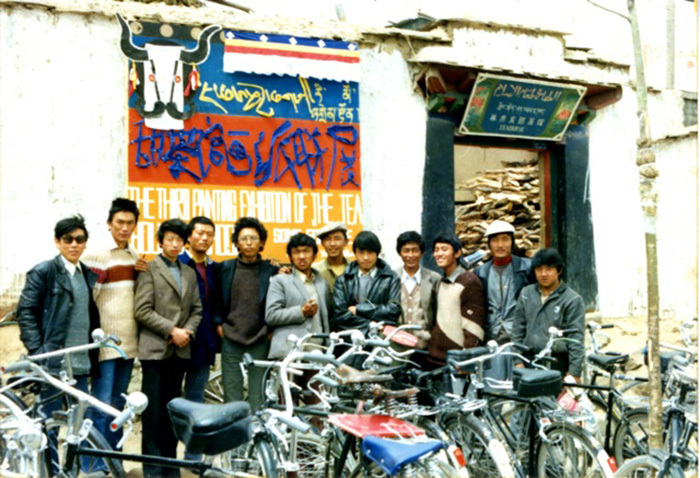 The Sweet Tea House group disbanded in 1987 when, after a successful exhibition covered by Lhasa radio and television and attended by TAR dignitaries, the artists were badgered by the authorities to accept official sponsorship, and to allow party-approved Chinese painters into the group. Gyatso also told me that the group split up as a few of the artists wanted to move on and do new things. Some stayed behind in Lhasa and later formed the successful Gedun Chophel Artist’s Guild. 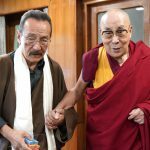 Gongkar Gyatso decided to escape from Tibet and made the long journey to Dharamshala where I ran into him. He told me he had hoped to find a “Yan’an” of exile Tibetans in Dharamshala, the kind of redoubt that the Communists under Mao had created in northern Shaanxi, to hold out against the Guomindang and Japanese armies. He was, of course, dissapointed. But my colleagues and I at the Amnye Machen Institute (AMI) cheered him up a bit by putting together a public exhibition of his paintings, the first ever in exile of a contemporary Tibetan artist. I remember it was on His Holiness’s birthday in 1993, and carried on for over a month at different venues. What a fascinating and obviously frustrating story. 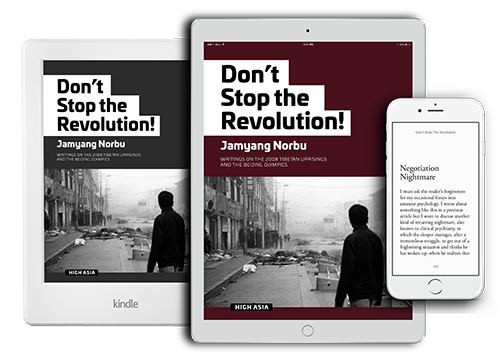 Thanks for sharing this account with us, Jamyang, and I hope you will find the time and energy to write the proposed book. Irish art struggled to free itself from both British colonial influences, and then from nationalist propaganda styles. Believe it or not, the American tourist market, and indeed the American art market geberally still expect Irish art to be covered in shamrocks, or “Celtic”squirls. The most avant-garde Irish art, sadly, has become part of the internationally indistinguishable post-modern “conceptual” mirage. Individual identity in art is hard to find, with the relentless pressure to be original rather than traditional. What a minefield. 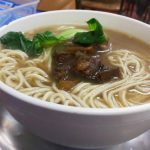 Thanks to you too, Gyatso, for posting the link to Metchak. Tibetan culture is obviously going to survive and thrive with such amazing artists. Whether the traditional forms survive is a different mattrer. But what wonderful, visionary paintings are being painted by Tibetan artists, especially in Tibet, even under Chinese rule. Refreshing and inspiring. Brilliant. Thank you, Jamyang-la, for your role with AMI and writing again about contemporary Tibetan art; I hope there is more to come. I completed my dissertation, “Contemporary Tibetan Art and Cultural Sustainability in Lhasa, Tibet” earlier this year, which focuses largely on another very interesting time period, 2003-2008. In relation to your piece here, I’d just note that Han Shuli continues to hold a powerful role in art circles in Lhasa/TAR. He also, from my point of view, ascribes to a very different notion of the role and identity of “artists” than do our friends in the Gedun Choephel Guild. You, Gonkar, and many others, are doing such good and important work. Always; so much to learn from you ; Jamyang la . Thank you for your intellectual generosity if; what I am trying to say here ; makes any sense at all to you.Anyway; all I really meant to say is , thank you ! Contemporary art is neither God nor ghost mixed everything on one Farm. That is the definition of contemporary art. Few days ago, accidentally attended an art show in New York” Tibetan Contemporary art” organized by Trace Foundation. Everything I saw was neither God or ghost. It is confusion and It is non-sense. I wish all those artists good luck. I am writing what I felt, right after I saw Dechen Tashi’s thanks giving written to you. 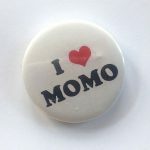 I actually wanted to say thank you to jam yang norbu la for these informations as I had a sight on this,but then comes second thought every time when I chose a side after reading your site. And I am saying that you have made a bad impression on yourself in the eyes of us youth.